All conversions and all apostolic activities in the Church are accomplished by grace generated by prayer. The Church teaches that the most efficacious form of prayer is prayer in the Presence of Jesus in the Blessed Sacrament. Prayer in the Divine Presence of Jesus in the Blessed Sacrament releases the power, the blessings, and the graces of God. The best example of this is from Scripture. Jesus asked His Apostles who touched Him, because He felt power go out from Him. He was referring to the woman who made an act of faith by touching the hem of His garment, knowing that by doing so she would be healed. Another time, the Gospel tells us that everyone wanted to touch Him because power and graces flowed out from Him. Each time that you go to Jesus in the Blessed Sacrament, you touch His Heart with your faith. Each holy hour that you make in the Presence of Jesus releases His power and graces upon you, your family, your parish, your diocese, and the world. This is why our Holy Father, Pope John Paul II, said that "the Church and the world have a great need of Eucharistic Adoration." The Pope canonized Maximilian Kolbe, who made ten visits every day to the Blessed Sacrament during his adult life. The Pope beatified Sister Faustina, who wrote in her diary that each holy hour of prayer so pleases the Heart of Jesus that each man, woman, and child on the face of the earth receives a new effect of Gods goodness and love because of the value of a single holy hour made in His Presence. The Pope also beatified Dina Belanger because of her devotion to Jesus in the Blessed Sacrament. 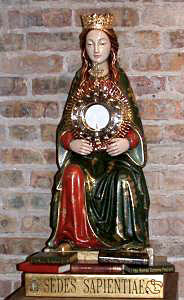 Jesus revealed to Dina the power of the holy hour in making reparation. One form of reparation is the ability to make up for what is lacking in the life of another. One day before her holy hour, Jesus showed Dina a multitude of souls on the precipice of hell. After her holy hour, Jesus showed the same souls in the hands of God. He told her that through holy hours of prayer a multitude of souls go to heaven who otherwise would have gone to hell as one person can make up for what is lacking in the lives of others by winning precious efficacious graces for their salvation. In other words, Eucharistic Adoration is the outpouring of Gods Divine Mercy on the world! This is one reason why in the past there were so many religious communities and monasteries devoted to Perpetual Adoration of the Blessed Sacrament. Now most of them no longer exist. God did not cause this, but He allowed it to happen because this is the age of the laity. Contemplative vocations that were once plentiful among the religious are now given to lay people. A growing number of lay people are experiencing a call to make a holy hour, not just weekly but daily. Bishop Fulton Sheen was the great apostle of the importance of the daily holy hour. I am convinced that if it were humanly possible to fully understand the value of a holy hour, everyone would either find time or make time to do it. The difficulty of finding time in todays busy world makes the daily holy hour that much more precious and meritorious in the eyes of God. For those who make a daily holy hour, or as a result of this article are inspired to do so, I ask you to please pray for the spread of Perpetual Adoration throughout the world. At the forty-fifth International Eucharistic Congress in June 1993 in Seville, Spain, Pope John Paul II prayed that the fruit of the Congress be the established of Perpetual Adoration in every parish throughout the world. The daily holy hour generates the graces necessary for the spreading of Perpetual Adoration. How to find Christmas peace in a world of unrest? You cannot find peace on the outside but you can find peace on the inside, by letting God do to your soul what Mary let Him do to her body, namely, let Christ be formed in you. As she cooked meals in her Nazarene home, as she nursed her aged cousin, as she drew water at the well, as she prepared the meals of the village carpenter, as she knitted the seamless garment, as she kneaded the dough and swept the floor, she was conscious that Christ was in her; that she was a living Ciborium, a monstrance of the Divine Eucharist, a Gate of Heaven through which a Creator would peer upon creation, a Tower of Ivory up whose chaste body He was to climb "to kiss upon her lips a mystical rose." As He was physically formed in her, so He wills to be spiritually formed in you. If you knew He was seeing through your eyes, you would see in every fellowman a child of God. If you knew that He worked through your hands, they would bless all the day through. If you knew He spoke through your lips, then your speech, like Peter's, would betray that you had been with the Galilean. If you knew that He wants to use your mind, your will, your fingers, and your heart, how different you would be. If half the world did this there would be no war! "The Piety of the Christian people has always very rightly sensed a profound link between devotion to the Blessed Virgin and worship of the Eucharist: this is a fact that can be seen in the liturgy of both the West and East, in the traditions of religious families, in the modern movements of spirituality, including those of youth and in the pastoral practice of Marian Shrines. Mary guides the faithful to the Eucharist,"
His own self for heavenly food,"
What is better: The visit Our Lady gave to Juan Diego, or one hour in the presence of Jesus in the Blessed Sacrament? Roses bloomed in the snow. A poor garment is imprinted with an image of Our Blessed Mother. It has lasted for centuries and no scientist can figure out how the image is on the cloth. She is the woman clothed with the sun. The sun is symbolic of her Eucharistic Son. Both hearts beat as one. Look at her request to the Bishop. Build a chapel. Who is in the chapel? Her Eucharistic Son! Mary brings all of her children to the Eucharist. During our holy hour of prayer there is always the beauty of Guadalupe. No matter how cold our heart, the roses of holiness bloom. The fragrance of sanctity will last for all eternity. Each moment we spend in His presence we grow, we bloom, we blossom like roses in the snow. And with each holy hour there is a new and special image indelibly imprinted on our soul. This image is far more beautiful than the one here at the shrine, where people come from all over the world and look with awe-inspiring amazement. All the angels of heaven gaze in ecstasy at the image left on your soul, dear Thomas, after each holy hour you make in the presence of Jesus in the Blessed Sacrament. "The Eucharist began at Bethlehem in Mary's arms. It was she who brought to humanity the Bread for which it was famishing, and which alone can nourish it. She it was who took care of that Bread for us. It was she who nourished the Lamb whose life-giving Flesh we feed upon,"
"The shepherds - simple souls - came to adore the Infant Savior. Mary rejoiced at seeing their homage and willing offerings they made to her Jesus... How happy is the loving soul when it has found Jesus with Mary, His Mother! They who know the Tabernacle where He dwells, they who receive Him into their souls, know that His conversation is full of divine sweetness, His consolation ravishing, His peace superabundant, and the familiarity of His love and His Heart ineffable,"
"In the final address of the Bishops at the Extraordinary Synod held to celebrate the Second Vatican Council, the whole Church was reminded of the need to keep the cross at the center of the Christian life. The Pope himself has said that the Catholic's point of contact with the cross is the Eucharist. This cross is the cross of sacrificial love, and it is precisely this love which will renew the Church..."
"The power of the Eucharist, whether it be for healing, renewal, spiritual growth or the creation of peace and justice comes from who, and not only "what" the Eucharist is. In the Eucharist Christ feeds His Church with His own sacrificial love..."
"Adore the mystery who is Christ Himself, the reality, the beauty and the power of love,"
Virgin Immaculate, perfect lover of Our Lord in the Blessed Sacrament, we ask you to obtain for us the graces we need to become true adorers of our Eucharistic God. Grant us, we beg of you, to know Him better, to love Him more, and to center our lives around the Eucharist, that is, to make our whole life a constant prayer of adoration, thanksgiving, reparation, and petition to Our Lord in the Blessed Sacrament. Amen. - from "Treasury of Prayer: Our Lady of the Most Blessed Sacrament"
"Recently I learned that a chapel for perpetual adoration of the Blessed Sacrament has been inaugurated in one of our parishes. Particularly encouraging was the spirit of collaboration which has characterized this initiative which includes more than 600 people from six parishes, all of whom have committed themselves to one hour of prayer in the chapel each week." "There are already a number of parishes in the Archdiocese which have offered the opportunity for perpetual adoration of the Blessed Sacrament..."
"Young people, the sick, mothers and fathers of families and many other categories of Gods people have discovered anew in prayer before the Blessed Sacrament a wonderful opportunity for praying the Lord of the harvest to send laborers into his harvest."
"For this reason I have asked that every parish participate...". But now there is no need of traveling far or of making many inquiries to find Him. He is, as we know by faith, in our churches, not far from our homes. The Magi could find Him in one place only; we can find Him in every part of the world, wherever the Blessed Sacrament is kept. Are we then not happier than those who lived at the time of our Saviour Himself? - from The Blessed Eucharist, by Fr. Michael Muller, C.S.S.R. in the Holy Eucharist that we may come to Him with confidence. in this Sacrament of infinite love. "It is this Real Presence, and the witnessing to it that inflames every page of the Gospel. At the birth of Christ, nothing could blind the inner eyes of the evangelists from seeing invisible realities, and penetrating the Real Presence. Luke saw angels coming down from heaven, singing and dancing in the very place where their Lord and Master was seen in human flesh. He heard the song of the angels: Glory to God in the highest and peace on earth (Luke 2:14). The invisible God now is visible; impossible events become realities. This is celebration! Matthew was seized by this Real Presence turned into celebration when he saw kings coming from the farthest corners of the earth to adore their King. There are here more miraculous events then the miracle itself. Matthew saw the stars and galaxies send one of their own, a special Orion, to illuminate the roads of the earth, and light the way to Christ, so that the world could see the face of God and not die." The little town of Bethlehem is taken from two Hebrew words which mean "House of Bread." He Who called Himself "the Living Bread descended from Heaven" was born in the "House of Bread" and was laid in the place of food, the manger. The first temptation Christ had in the beginning of His public life was to become a bread King, and to win men by supplying them with food. On one occasion when they attempted to make Him King after multiplying the bread, He fled into the mountains. Rome once rang with the cry: "Bread and circuses." But the Bread that was brought at Bethlehem was an entirely different kind: "Not by bread alone does man live." The body has its bread. Shall not the soul have its food too? Those who have nourished themselves solely on the bread of the stomach and ignored the Bread of the soul have cried out with some of the bitter disappointment of the Lord Chesterfield: "I have seen the silly rounds of business and pleasure, and have done with them all. I have enjoyed all the pleasures of the world and consequently know their futility, and do not regret their loss. Their real value is very low; but those who have not experienced them always over-rate them. For myself, I by no means desire to repeat the nauseous dose." In the bread and the wine? In the bread and the wine?,"
"God was not content with giving us His only Son once for all, willing Him to take flesh in the womb of a Virgin - flesh like ours, so that He might suffer and die for us on the Cross - but He wished Him to remain with us forever, perpetuating His real presence and His sacrifice in the Eucharist. Had we nothing but the Gospel... we would have only nostalgic memories; Jesus would no longer be with us, but only in heaven at the right hand of the Father... With what regret we would think of the thirty-three years of our Savior's earthly life passed centuries ago! Oh, how different the reality! The Eucharist makes the presence of Jesus with us a permanent one." - from Divine Intimacy by Fr. Gabriel of St. Mary Magdalen, O.C.D. "'And the Word became flesh'. That truth became a reality in the manger at Bethlehem. But it was to be fulfilled in yet another form: 'Whoever eats my flesh and drinks my blood, has eternal life.' The Savior, who knows that we are human beings and will remain human beings who have to struggle daily with weaknesses, comes to our assistance in a truly divine manner. Just as the human body is in need of daily bread, so also does the divine life in us require constant nourishment." "Whoever really takes this as his daily bread, experiences EACH DAY the mystery of Christmas, the Word made flesh." "And that is doubtless the surest way to maintain constant union with God, to grow each day more firmly and deeply into the mystical Body of Christ. I am well aware that for many that is an all too radical request. In a practical sense, it will mean for most--when they first start--a complete change in their external and internal life. But that's exactly what it is supposed to be! To make room in our life for the Eucharistic Lord, so that he can change our life into His, is that asking too much? One has time for so many useless things: all sorts of stupid stuff gathered from books, newspapers and magazines; sitting around in bars and gabbling on the street for a quarter-or half-hour; all these are diversions which waste time and energy like crumbs. As a challenge to the whole day, should it not be possible to put aside a morning hour in which one is not distracted but recollected, in which energy is not wasted but gained? "But, of course, this requires more than just one hour. From one such hour to the next, one must so live that it may come again. It is no longer possible to 'let yourself go', even if only for a time. One cannot escape the judgment of those with whom one daily associates. Even if no word is spoken, one senses how the others feel towards him." "He may try to adapt himself to his companions, and if it is not possible, their common life becomes a torture. "It's the same in our daily encounter with the Lord. One becomes more and more sensitive to that which pleases Him or not." "If, on the whole, one was previously quite satisfied with himself, it will now take a different turn. One will find much that is bad and will change it as far as he chooses." "And he will discover many things he cannot consider well and good, but which are nevertheless hard to change. Then gradually, he becomes very small and humble; he grows patient and indulgent toward the splinter in strange eyes because the beam in his own is brought into being; and, finally, he also learns to be patient with himself in the inexorable light of the divine Presence and to surrender himself to the divine mercy which can take care of all that ridicules our energy. The road is long from the smugness of a 'good Catholic' who 'does his duty', reads a 'good newspaper', 'does the right thing', etc. but on the other hand does what he pleases, "to a life in God's hand, in the simplicity of a child and the meekness of the tax collector. BUT WHOEVER HAS ONCE WALKED IT, WILL NOT GO BACK AGAIN." Merry Christmas! A holy night, a silent night with Mother and child, all is calm, all is bright. This inspiring hymn came to us because an organ in Germany broke down about one hundred years ago. Without an organ the parish priest in this small country church said it would be a "Silent Night". The organist would compose a melody. The priest would write the lyrics and the choir would just sing the soft praises of this hymn for midnight Mass. That is all it was meant to be, just a simple hymn sung once and forgotten. Then a snowstorm prevented the man who fixed the organ from coming until the snow melted in the spring. After he finished he noticed the music left on the organ since Christmas night and took it back to Munich. The rest is history. "Silent Night" has reverberated throughout the ages. With its quiet sounds of love and peace it has inspired millions and millions, touching the lives of countless people. It is the same with a holy hour. We leave it in the chapel like the music to "Silent Night," and God turns our hour of prayer into a never-ending stream of graces for His people. A single holy hour of prayer touches more hearts through Gods grace, than all the people who have ever been touched by "Silent Night". From a single holy hour of prayer Gods graces reverberate throughout the world until the end of time and will continue for all eternity. This is because of the divine appreciation God has for those who love His Son in the Blessed Sacrament. The Father will spend all eternity thanking you and loving you in heaven because you have honored His Son on earth in the Blessed Sacrament. The Blessed Sacrament is the continuation of Christs Incarnation on earth. Coming to the Blessed Sacrament we find the same humility and gentleness that the shepherds found in "the babe lying in a manger". (LUKE 2:15). The hunger in the heart of God for the love of man is expressed in the profound humility of these two words, Baby Jesus. How great is Gods desire for intimacy with man! Jesus came as a Babe, because no one is ever afraid to come close to a baby. A baby is lovable in its vulnerability. A baby reaching our for love with open arms is irresistible. The Sacred Host embodies the Divine Tenderness of the Incarnation. So gentle and humble, so loving and small and vulnerable, the Blessed Sacrament is Jesus saying "Come to Me...for I am gentle and humble of Heart". (Mt. 11:30). Only the humble hear His voice. Only those with a childlike heart seek His Heart in the Blessed Sacrament. This is why Jesus says: "Let the children come to Me; do not prevent them for the Kingdom of God belongs to such as these." (Mk 10:13). The Holy Eucharist is the continuation of Christs incarnation on earth. The mystery of the Eucharist gives us the joy of having Christmas everyday. When we come to the Blessed Sacrament we come to Bethlehem, a name which means house of bread. Jesus chose to be born in Bethlehem because He would dwell with us forever as the "Living Bread" come down from heaven. When the shepherds and Magi came to adore Him, they brought Him so much joy with their humble visit to Bethlehem that their visit has been praised and retold down through the centuries. God has never stopped honoring them for honoring His Son in Bethlehem. So too, your humble visit to Jesus today in the Blessed Sacrament brings Him so much joy that it will be retold for all eternity and bring the world closer to His promise of peace on earth. We are as privileged in being called to adore Him today as were Mary, Joseph, the shepherds and Magi then, because here Jesus continues His incarnation on earth. Here Jesus loses His Heart to us in love. Love expresses itself to the object of its affection; the Eucharist is the continual expression of Gods perfect, unselfish love for man. The Word again becomes flesh and dwells among us, veiled under the Species of the Sacred Host, where the same Jesus born two thousand years ago as a little babe in Bethlehem is truly, really, bodily, and personally present to us in this Most Blessed Sacrament. The greatest love story ever told is contained in the Sacred Host. Here we see His glory in the depth of His humility, for God Who created the whole world and Whom the whole world cannot contain, contains Himself in the Blessed Sacrament for love of us, to be our Good Shepherd who leads us to life-giving waters, to be our Divine Physician who heals the brokenhearted, to be our Divine Companion in our pilgrimage throughout life. Here you behold His glory IN THE MIRACLE OF HIS LOVE, for He becomes small in the Sacred Host that He may give Himself to you where "you are filled with the fullness of God." Jesus becomes poor in the Blessed Sacrament, "emptying Himself" of His glory and majesty, that He may make you rich with the abundance of His grace, "transforming you from glory to glory" and making your soul everlastingly more beautiful with each communion and each visit you make to Him in the Blessed Sacrament. "For your sake He made Himself poor though He was rich, so that you might become rich by His poverty." The Eucharist is Divine Love made visible in the Sacred Host! This is why the angels continue to sing to Him here as they did in Bethlehem: "Glory to God in the highest and peace to men of good will." COME LET US ADORE HIM for here Jesus continues to come to us "filled with enduring love" as the Word becomes flesh in the Holy Eucharist and makes His dwelling among us. "IT IS HE WHO IS OUR PEACE." "The Bethlehem of that night...has never passed away. It lives a real life, - not the straggling Christian village on which the Mussulman yoke seems to sit so lightly, on its stony ridge, but the old Bethlehem of that momentous hour when the Incarnate God lay on the ground amid the Cattle in the Cave. It lives not only in the memory of faith, but in faith's actual realities as well. It lives real, unbroken, unsuspended life, not in history only, or in art, or in poetry, or even in energetic fertile worship and fleshly hearts to the faithful, but in the worshipful reality of the Blessed Sacrament. Round the tabernacle, which is our abiding Bethlehem, goes on the same world of beautiful devotion which surrounded the new-born Babe, real, out of real hearts, and realized by God's acceptance." "Let every knee bend before Thee, O greatness of my God, so supremely humbled in the Sacred Host. May every heart love Thee, every spirit adore Thee and every will be subject to Thee!" "My patrons in Heaven and my chosen favorites are those who have stolen it - like the Holy Innocents and the Good Thief. The great Saints have earned it by their works; as for me, I will imitate the thieves, I will have it by ruse, a ruse of Love which will open its gates to me and to poor sinners. The Holy Ghost encourages me, saying in the Book of Proverbs: "O little one, come, learn subtilty of Me." (Prov. 1:4)"
is the Christ of the Eucharist,"
..."The Eucharist completes the restoration begun in the Crib. Make merry therefore on this beautiful day, on which the sun of the Eucharist is rising. Let your gratitude never separate the Crib from the Altar, the Word made flesh from the God-Man made Bread of Life in the Most Blessed Sacrament,"
We say a person has a "sense of humor" if he can "see through things"... God made the world with a "sense of humor," in the sense that we were to see Him through His creation: to see His Power in the mountains, His Beauty in the sunset, His Wisdom in a snowflake, His Love in the human heart. Poets have inherited this sense of humor for, like Thompson, they can look at the sun and see in it the Host that is raised in Benediction over the world, and at night set in the Flaming Monstrance of the west. Saints must have a sense of humor, so as to be able to see a resurrection through the trials and sorrows of life. Man loses his sense of humor through sin. He begins to take money seriously, flesh seriously, business seriously, food seriously. These have no other purpose than just to satisfy him. Now Christmas Day was the restoration of humor, and those who displayed it most were the shepherds and the wise men. They came to this little Babe and "saw through Him" - God Himself. His Flesh was the Sacrament of His Divinity. When the Babe grew, He taught parables in or with a sense of Divine Humor. Salt and camels, sheep and goats, patches on old clothing, wine in old bottles, businessmen, traders, were not to be taken seriously. All were telltale of something else. Christmas then is a romance and a joy only to those who have a sense of humor, whose vision is not opaque when they look at a Babe, but can see through Him all the problems of life answered in the vision of God Who appeared as a Man. They who pass through this life with that sense of humor, which is faith, will one day be rewarded by the one thing that will make heaven Heaven - His Smile. "But God loved us so much that He was not satisfied with looking upon us only in a divine manner. In order to adapt Himself to our weakness and conform Himself to the demands of our own way of loving, He wanted to look upon us also with human eyes like ours, with eyes that can radiate joy, reflect sadness, and shed tears, revealing all the tenderness of a heart as sensitive as ours." "The gaze of Jesus! Who could describe its wonderful sweetness, its great tenderness, its endearing gentleness, its inscrutable depth and irresistible attraction?" "When Jesus was a little babe, His eyes radiated treasures of candor, innocence, and purity, enough to wrap the whole world in their brilliancy. When they were mirrored in the immaculate Mary's eyes, the radiance of the two purest souls the world has ever known was merged in one, and the flame burning in the two most loving hearts the world has ever known united in one great blaze of love." "The eyes of the boy Jesus reflected His grace and wisdom more and more every day. And the eyes of Jesus, the man - with what kindness and compassion they rested on children, on the sick, on the afflicted, and on sinners!" "Emboldened by the friendly glance of His eyes, the little ones would climb up on His knees and nestle against His breast; and He would look upon them with deep tenderness, caress them, and enfold them in His arms..."
"Those who love and see each other feel irresistibly attracted to each other; they cannot bear to be separated. This, we may believe, was one of the reasons why Jesus invented the Eucharist. He wanted to shorten the distance; to look on us, not alone from far-off heaven, but from near by, so near that, if the sacramental veils of the Mystery were rent, we should be able to hear His throbbing Heart and see ourselves mirrored in the pupils of His eyes." May Thy kingdom come! May it spread far and wide; may it gain prestige; may it progress in every way! That is what we must wish our Lord on this New Year's Day. May He be known and loved by those who neither know or love Him! May everyone complete in himself the work of the Incarnation and of the Redemption! And where is our Lord known and loved? Ah! How very small is the kingdom of Jesus Christ! So many of His rights and those of His Church have either been taken away or curtailed during the last three centuries! They drive out our Lord and deprive Him of His people and His churches. How numerous are these Eucharistic ruins! To work for the preservation of the Faith, speak the language of a Christian, the language of faith. Transform the speech of the world. Through a sinful tolerance, we have allowed our Lord to be banished from customs, laws, and good manners; in a mixed social gathering one would not dare speak of Jesus Christ. Even among practical Christians we should seem peculiar if we spoke of Jesus Christ in the Blessed Sacrament... There may be talk about religious art, moral truths, the beauties of religion; but about Jesus Christ, about the Eucharist, never. Well, change all that. Profess your faith openly. Be bold enough to say, "Our Lord Jesus Christ," never just "Christ"! We must prove our Lord's right to live and to rule in the language of society. It is a disgrace for Catholics to keep our Lord under a bushel the way that they do. We must manifest Him everywhere. The one who professes his faith boldly and dares speak out the name of Jesus Christ, places himself in the power of His grace. In public, everybody must know what we believe. ...Finally, may the kingdom of our Lord come within you, in your soul. Our Lord is in you, but He has much to do before He can reign completely therein. You have been barely vanquished; our Lord's kingdom of peace and love is not yet established in you; the boundary lines are not yet all His; and what sovereign can rule supreme if he does not control all the frontiers of his state? Get to know our Lord better. Study His life, His sacrifices, and His virtues in the Most Blessed Sacrament. Study His love. Instead of always remaining within ourselves, let us go up to Him; it is all very well to see ourselves in Him, but to see Him in us is better. Instead of attending to yourself, attend to our Lord and make Him grow in you. Think of Him; study Him in Himself; penetrate into Him. You will find the food of your life in Him; for He is great and infinite. That is the broad and royal road to holiness and the way to the ennobling of our lives. Moreover, you must console our Lord. He expects consolation from you and will receive it with pleasure. Ask Him to prepare good priests for Himself; priests who are apostolic and zealous for the salvation of souls; priests who are the glory of their age and who present God with kingdoms. Beg Him to take ownership of everything, and to be not only a Savior, - that supposes nothing but sacrifice, - but a King, and a King of peace with absolute power. Console Him for His being so little treated as a King in His own kingdom. Alas! Our Lord is vanquished! In heaven He is an all-powerful Ruler Who commands saints and angels and is faithfully obeyed. Not so here below. Men, - the children He ransomed, - have got the best of Him. He no longer rules over Catholic peoples. Let us establish His kingdom in us at least, and work at restoring it everywhere. Fine monuments mean much less to our Lord than do our hearts. And since the nations have driven Him out, let us raise Him a throne on the altar of our hearts... Let us proclaim Jesus Eucharistic our King by lifting Him up on our hearts and by serving Him with fidelity and devotedness. Ah! How fond our Lord is of our hearts! How He longs for them! He pleads for them like a beggar! He begs, He implores, He insists. He has already been refused a hundred times; it does not matter; He keeps holding out His hand. ...What outrages He submits to in His quest for our hearts! He seeks in a special way the Catholics, the devout souls, the religious who do not want to give Him their whole heart. Our Lord wants the whole of it. His love for us is the only reason for this ardent quest and the only interest He has in it. Out of two hundred million Catholics, how many love Him with the affection of a friend? How many live of His love, of a love that springs from the heart? Let us then love Him for our own sakes. Let us love Him for those who do not love Him, for our relatives and our friends. Let us pay our familys debt and our countrys. That is what all the saints do; they thus imitate our Lord Who loves His Father for all men and becomes surety for the whole world. May our Lord, the gentle Savior Who loves us so much, become at long last the King, the Master, and the Spouse of our soul! "Come, let the kingdom of Jesus Christ be established in you! Public Exposition of the Most Blessed Sacrament is God's last grace to man. After Exposition, there is only heaven or hell. Man is attracted to what glitters. Our Lord has ascended a throne; He can be seen and is radiant. We no longer have any excuse. If we forsake our Lord, if we pass by Him without amending our lives, our Lord will go away, and we shall be done for forever. "Serve our Lord, therefore, and console Him; light the fire of His love wherever it is not yet burning; work at the establishment of His reign of love. Adveniat regnum tuum, regnum amoris. "May Thy kingdom come, Thy kingdom of love!"